A Windows 8 bootable DVD or USB drive that contains Windows 8.1. To get it, go to this page on the Windows Dev Center. Note If you plan to develop apps for Windows Phone also, you need a 64-bit (x64) version of Windows 8.1. Otherwise, a 32-bit (x86) or 64-bit version of Windows 8.1 is fine. Run the VMware-Fusion-Build_Number-.dmg package that you downloaded earlier. VMWare Fusion install should start. In the VMware Fusion requires administrative privileges... dialog box, type your Mac user name and password, and click OK. 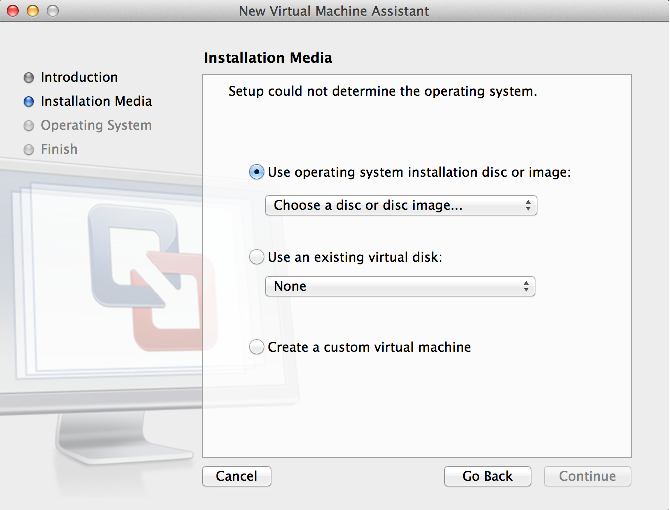 In the Would you like to help improve VMware Fusion dialog box, click No or Yes to continue with the installation. If the VMware Fusion wants to make changes... dialog box appears, type your Mac user name and password, and click OK. In the Licensing dialog box, type your license key, and click OK.
After VMware Fusion is installed, you'll see the start page. In the start page, click Create New. The New Virtual Machine Assistant starts. 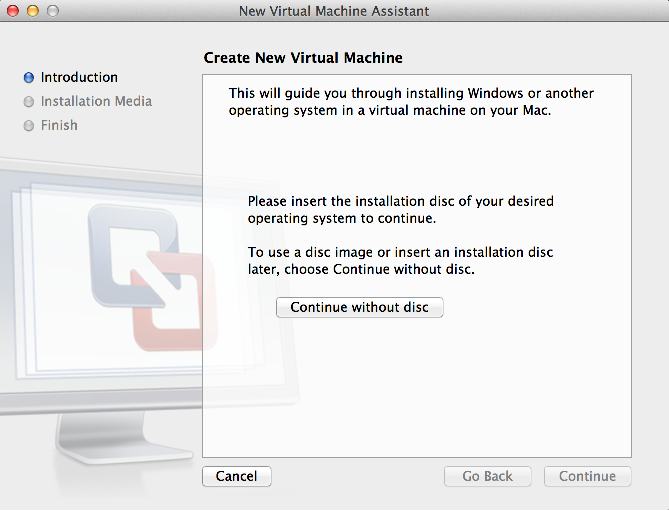 In the Create New Virtual Machine page, click Continue without disc as shown in the following figure, and click Continue. Note If you have a Windows 8.1 bootable DVD, instead of clicking Continue without disc, just click Continue. Note The screen shots in this topic show an English example of the UI. The actual UI that you see may differ depending on your locale. The Installation Media page appears. Complete the on-screen directions to help VMware Fusion find your Windows 8.1 bootable DVD or Windows 8.1 disk image (.iso) file, as shown in the following figure. Then click Continue. In the Choose Operating System page, click Microsoft Windows in the Operating System list. In the Version list, click the version of Windows 8.1 that matches your Windows 8.1 disk image (.iso) file's architecture. Then click Continue. In the Finish page, click Customize Settings. Select a file name (for example, "Windows 8.1 x64") and a location to save this virtual machine, and click Save. The Settings page appears, as shown in the following figure. Click Processors & Memory. In the Processors & Memory page, select the number of processors and memory that this virtual machine will use (2 processor cores and at least 2 GB (2048 MB) of memory; using 4 GB (4096 MB) is optimal.) Then expand Advanced options, check the Enable hypervisor applications in this virtual machine box as shown in the following figure, and click the Back button to return to the Settings page. Click Advanced. In the Advanced page, in the Preferred virtualization engine list, click Intel VT-x with EPT, as shown in the following figure. Close the Advanced page. 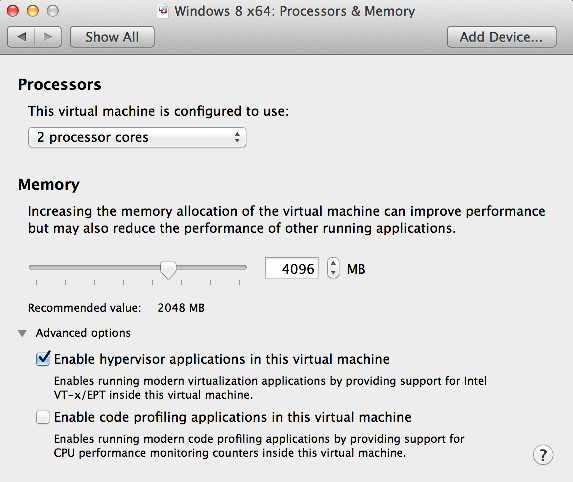 The Virtual Machine Library page appears. Modify the virtual machine package file: open Finder. Click Documents, and click Virtual Machines. Right-click the virtual machine that you just created (for example, "Windows 8 x64"), and click Show Package Contents. 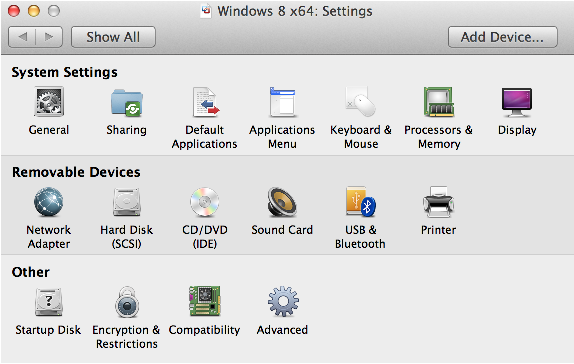 Right-click the corresponding virtual machine package file (for example, the "Windows 8 x64.vmx" file), point to Open With, and click TextEdit. In TextEdit, at the bottom of the file, type hypervisor.cpuid.v0="FALSE". Then save and close the file. Start the virtual machine: back in the Virtual Machine Library page, in the Virtual Machines list, click the virtual machine that you just created (for example, "Windows 8.1 x64"), and click Start Up. The virtual machine starts. After you click Start Up from the previous step, your virtual machine starts installing Windows 8.1 automatically. After you finish installing Windows 8.1, install the VMware Tools. 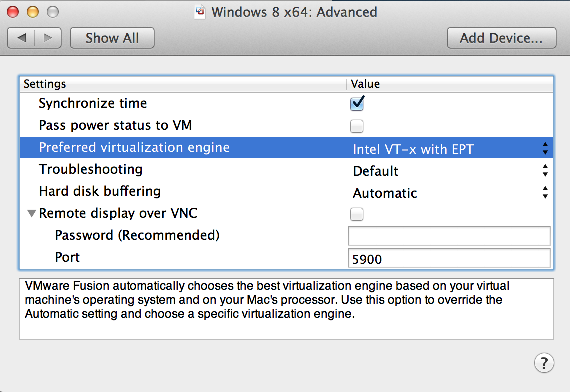 On the Apple VMware Fusion menu, click Virtual Machine, and click Install VMware Tools. Back in Windows 8.1, on the Desktop, in the Click install to connect the VMware Tools installer CD to this virtual machine dialog box, click Install. When the VMware Tools: Tap to choose what happens with this disc notification appears, click it. In the VMware Tools: Choose what to do with this disc dialog box, click the Run setup.exe icon. If the Do you want to allow the following program to make changes to this computer dialog box appears, click Yes. The VMware Tools wizard appears. In the Welcome to the installation wizard for VMware Tools page, click Next. In the Setup Type page, with Typical selected, click Next. When the install is finished, click Finish. Restart your virtual machine to continue. When prompted, click Yes. The virtual machine restarts. When prompted, sign in again to Windows 8.1 to continue. In Windows 8.1, use Windows Internet Explorer to go to Developer downloads for programming Windows Store apps. In Download the tools and SDK, click Download now. Complete the installation for Visual Studio 2013.